Blackjack is one of the most popular casino games. It's a game of skill and chance between a player and the Dealer. Microgaming casinos offer Triple Sevens progressive Blackjack version that is played with five standard decks of 52 playing cards that are shuffled before each hand (game). Triple Sevens has a side bet that makes you eligible for additional payouts, such as the Progressive Jackpot. Triple 7's Progressive Blackjack has the same rules as multi-hand blackjack game except only one hand should be played at a time and there is a mandatory $1 side bet if you want to win the progressive jackpot. I.e. the betting limits starts at $2+$1 and ends at $200+$1. The side bet is compulsory and is fixed at one credit. The Dealer must stand at ALL 17. A Player can double down only on a hand of 9, 10, or 11. Unlike 10-value cards cannot be split. For your regular blackjack bet, you may wager anything from 2 credits to 201 credits, including compulsory 1 credit side bet for a chance to hit the progressive. Before each hand, a compulsory side bet of 1 credit is automatically placed in the Jackpot spot on the blackjack table. This side bet makes you eligible to win a progressive jackpot with a value shown in the top right corner of the game screen. For just a small side bet of 1 credit, you could win many thousands of credits. Insurance is not recommended in Triple Sevens game. Splitting will void the chance for you three sevens win. Thus, splitting is also not recommended. The house edge for side bet is rather high - 38% when the jackpot value is $10,000 but the edge is equal to zero at $110,000. The higher the value of progressive jackpot, the lower the house edge. The following strategy will help you keeping the best odds. The strategy is very similar to the Multihand 5-deck blackjack game. When the player has two sevens and the dealer has a 7 or less (shown as H/SP) these strategy depend on the amount of player's bet. In general, if you bet $42 or less then you should always Split your pair. If you bet more then $42 it depends on the dealer's hand and amount of your bet, but if you bet $150 or more, you should always Hit with your two sevens. If you have the diamond sevens you should always Hit too. 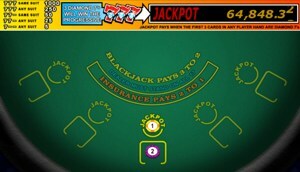 Today Microgaming online casinos offers over 30 different variations of single hand and multi-hand Blackjack including: Atlantic City Blackjack, European, Spanish 21, Perfect Pairs, Vegas Strip and Downtown, Double Exposure BJ, Triple Sevens and Gold Series versions of blackjack (the complete list of the games can be found on the bar menu). See also rules and strategy card for progressive blackjack game from Cryptologic.